In order to exercise in the new NAV Modern Development Environment I thought to implement a comparison of two sorting algorithms directly in Visual Studio Code AL Language: Insertion Sort and Merge Sort. Most of the sorting examples over the internet are using arrays, but the issue with arrays is they have fixed length that needs to be declared upfront. Of course I didn’t like this even if it is just an example with educational purpose. Or someone maybe will use it also for a real situation, we’ll see. Before I started to write this post I implemented the Insertion Sort using temporary tables because I was sure that the List has it’s own Sort method so it wouldn’t be fun to create something that already exists and performs much better. But it seems it’s not the case. How did Microsoft miss this one ? 1) CreateInMemory: The Random numbers that will be sorted are created at run time, in memory: this is fine for small tests, but in case of more than 10000 numbers, it takes too long time to populate the List/Temp Table with random numbers. 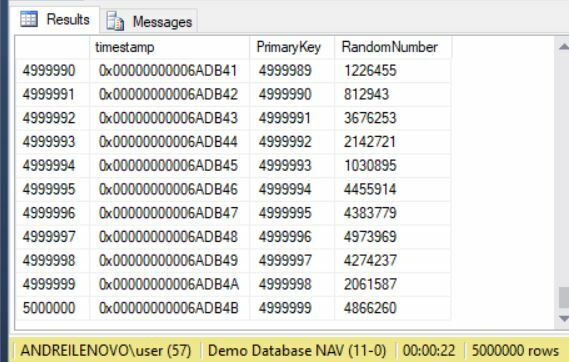 – No of Random Numbers in Memory: specifies the number of random numbers created in memory in an AL List or Nav Temporary table. – Random Selection Max Number Memory: ex: if you want to generate in memory 5 random numbers selected from numbers between 1 to 10 you will specify here 10; if you want 5 number from 1 to 5 you specify here 5 etc. – Random Selection Max Number Table: similar to “Random Selection Max Number Memory” but for the numbers inserted into the database. – Maximum Values Displayed in Message: after you sort numbers, the program displays the initial numbers (unsorted) and resulted numbers (sorted) in a message. In case you have a lot of numbers the message cannot display because the text is too long. By filling this field the program will display only the numbers until the value specified in it. Ex: if you sorted 100.000 numbers and this value is 300 the program displays first 300 numbers and text: “and 99.700 more”. 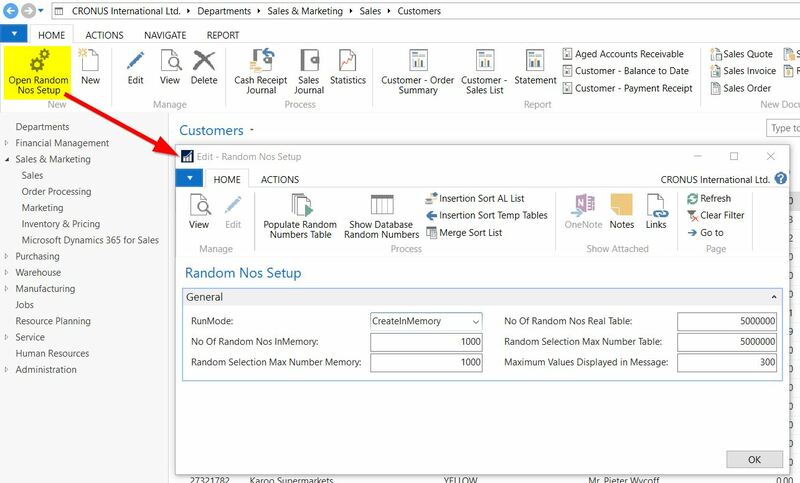 If you want to use the option RunMode = CopyFromDatabase you first have to populate the Random Numbers Table. When you select this option I implemented a check: in case the Random Numbers table is empty, it will ask if you want to populate it. If you select Yes, it will run the same script as action “Populate Random Number”. If you use action “Populate Random Numbers” and you already have data in the Random Numbers table, it will delete all existing data and create a new set of numbers. So, I hope I explained clear enough how I designed this small app. Now, I will explain how I implemented the Insertion Sort using the AL List, then Nav temporary tables and I will leave for the end the Merge Sort. (start with an easy thing and finish with a more complicated one). 3) Now, the merge sort. The logic of this algorithm is best explained in this link. This is much, much faster than Insertion Sort and other simple algorithms: for example it can sort millions of random numbers in just few seconds while the insertion sort needs minutes for 100.000 random numbers. *I used the Windows client because in the current Web Client there is a limitation and the Progress Dialog is not displayed correctly. – The insertion sort performs good when there are not a lot of numbers to be sorted or it is used for numbers that are already “almost” sorted. For example in case of adding new numbers to a previusly sorted list and then sorting the list again. For random numbers it works fine for 1000-3000 numbers, but in case of more than 10000 it takes some time. For this kind of situations there are better sorting algorithms, for example the Merge Sort. – When possible use the AL List. It can be much faster compared to temporary tables for a lot of situations. Depending, of course, on your algorithm that uses it. 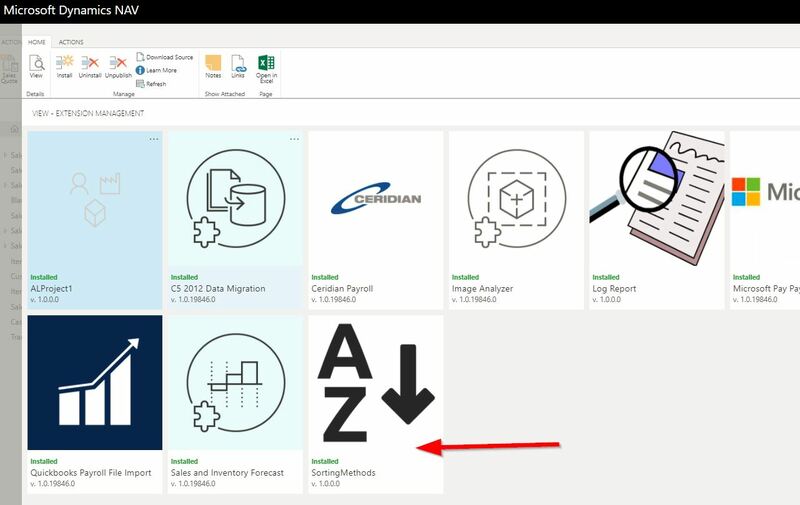 – If you need to sort an AL List, you can use the Merge Sort from this project until Microsoft implements the sorting method for this object in AL. – It would be interesting to create the QuickSort algorithm in NAV as well, in order to compare it with the Merge Sort, but I didn’t have time to do also that. Maybe will do it in future or if someone else does it, please share.